Pet Your Fish | OhGizmo! Ant Farms – TO THE EXTREME! Why don’t I keep fish as pets? It’s simple: lack of interactivity. Sure, they’re pretty or whatever, but you just sprinkle food at them occasionally and they go about their business while you go about yours. This fish tank however brings you and the fish together, letting you feed the fish much more directly. 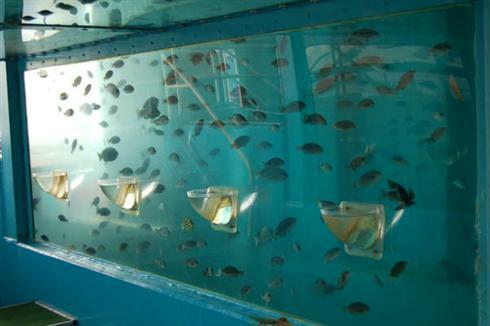 The little cups on the sides of the tank in the picture are connected to the tank and open to the air, which allows the fish to swim into the cups to be hand fed (and petted or nuzzled if that’s your thing). The tank is sealed at the top, creating a vacuum which prevents the water from pouring out. It’s a custom tank, but it should be a fairly straightforward DIY project if you’re fish-obsessed, or just really really lonely. Lots more pics here. I guess this is the definition of a very complex device to solve an easy problem. If you want more interaction with your fish, just open up the top and feed them. I have fish, and they beg more than my dog. As soon as I open up the top, they are up there, going nuts. If I wanted to hand feed or pet them, which I have never really considered, I could just do it. No need for a custom fish tank. This is ridiculous. The oils and what-have-you on your hands can kill your fish. It will also ruin its little enviourment by contaminiating the water with various human crap (i.e perfumes, lotions, cleaning chemicals, soap) etc. Also, what stops the fish from jumping out? Fish to tend to jump about… Not a worthwhile investment. Really a stupid solution for a problem that doesn’t exist. I guess it depends on one’s definition of “interactivity’. Fish can clearly recognize feeding time and their owners. If you have a reef tank, there are a variety of animals which can be added to the tank which will interact such as cleaner shrimp and starfish. But yes, the fish won’t sleep at the foot of the bed with you. Hi there bees searching for fish recipes and found your blog reg Pet Your Fish ..i have gone through your site? its very informative and useful too.. here we can learn more about marketing online?. will bookmark it and come back for more!